- Season chicken with salt and pepper, reserving a bit (about 1/8 tsp) for the Brussels sprouts. - Wash and dry your Brussels sprouts. Trim and halve each sprout. - Heat a large skillet over high heat. Add 1 tbsp extra virgin olive oil until it’s shimmering. The pan is ready when a splash of water sizzles and quickly evaporates. Sear the chicken skin (or where the skin would be) side down, allowing it to get a nice brown crust, about 4-6 minutes. Flip the chicken over and continue to cook over medium heat. - It’s best to use a meat thermometer when cooking any protein, it’s the easiest way to get perfect results every time! My favorite meat thermometer is from IKEA that is only $6.99! You can set it on Cook, setting the thermometer to the desired temp. For dark chicken meat, you want to cook the meat until it reaches 165-175F. The meat thermometer beeps when the meat reaches the appropriate temp - no dry or undercooked meat! - Cook the chicken to 165F internal temp and remove from the pan. Place the chicken on a plate and keep warm. - In another skillet, heat remaining 1 tbsp oil and 1 tbsp butter over medium-high heat. 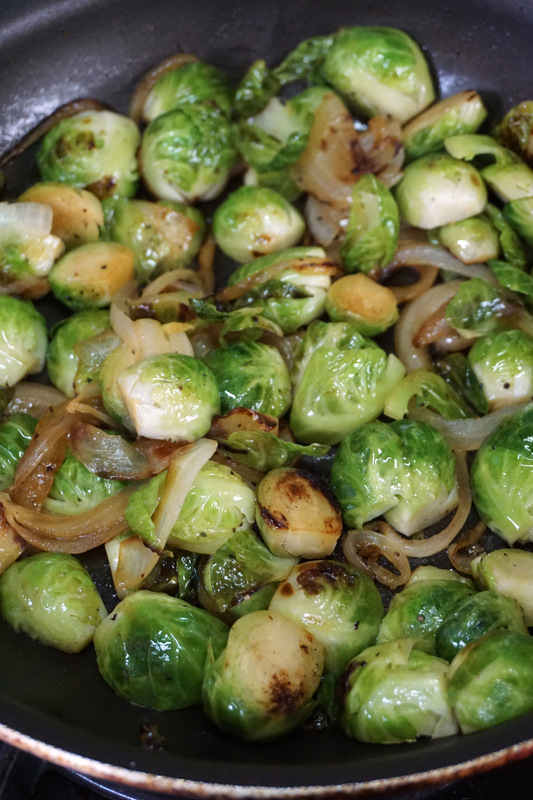 Add the Brussels sprouts (I also included some onions). Sauté 2 minutes or until nicely browned. Season with the remaining 1/8 tsp salt and add ¼ cup of chicken broth to the pan. Cover and cook 4 minutes, then remove the lid and cook until crisp and tender. - Heat the pan you cooked the chicken in over medium-high heat. Add ½ cup chicken broth and the apple cider vinegar. Bring to a boil, making sure to scrape the pan to loosen up the browned bits. - After it comes to a boil, reduce heat to medium-low and simmer 4 minutes or until it thickens. There is pectin in apple cider vinegar that helps to thicken the sauce naturally. Once the sauce has thickened, whisk in mustard, 1 tbsp of butter and fresh chopped parsley. Serve the chicken and sprouts with the finished sauce. The meat is flavorful and perfectly tender, drowning in the zesty mustard sauce. The apple cider vinegar adds such a kick to this dish! The Brussels are crisp outside, nice and steamy inside. The fresh parsley adds the perfect bite at the end. I love how quick and easy this meal is - and it’d be perfect over quinoa, brown or white rice, zoodles, or even over some greens.